Hausa is an African language originating in Niger and northern Nigeria and spoken widely in West and Central Africa as a lingua franca. Charles Henry Robinson (1861-1925) was the first student of the short-lived Hausa Association, formed in 1891 to promote the study of the Hausa Language and people. 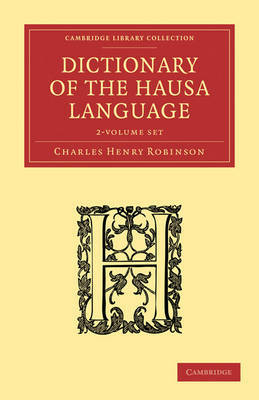 The Association sponsored Robinson to stay in northern Nigeria from 1894 to 1895 to gain more experience in the language. On his return Robinson published an anthology of Hausa texts in 1896 and a Hausa grammar in 1897 as well as this two-volume dictionary in 1899. His efforts contributed greatly to Western knowledge of the language despite criticisms of his relatively short experience of Hausa-speaking communities. Volume 1 is a Hausa-English dictionary, while Volume 2 is an English-Hausa dictionary, for those wishing to speak colloquial Hausa. The version reissued here is the 1925 fourth edition.